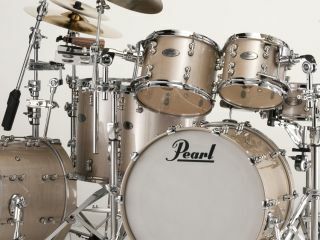 NAMM 2011 PRESS RELEASE: Pearl's all new Reference Pure drum kit proudly builds upon the legacy started by Pearl's original Reference Series Drums by using the exact shell composition formula, the same number and type of wood plies, and the same targeted task specific bearing edges to create a thin shell, highly resonant, lower mass version of the original. To accomplish this, we start the process by choosing thinner plies of prized Maple, hand selected Birch and rare African Mahogany. While Reference drums use a rotating combination of both 1.6mm and .9mm wood plies in its shell construction, the all new Reference Pure uses only .9mm thick plies in its construction. The result is a thin, resonant, extremely vibrant yet powerful near-field experience for the player with the wonderful accentuation effects of Birch and African Mahogany placed exactly where they are needed most. To maintain maximum resonance, Pearl's Reference Pure features our super low-mass elegantly designed STL Tube Lugs and our all new thin Fat Tone Hoops with our exclusive hemmed and welded edge resulting in a hoop that is both lightweight and extremely strong to further promote maximum resonance.